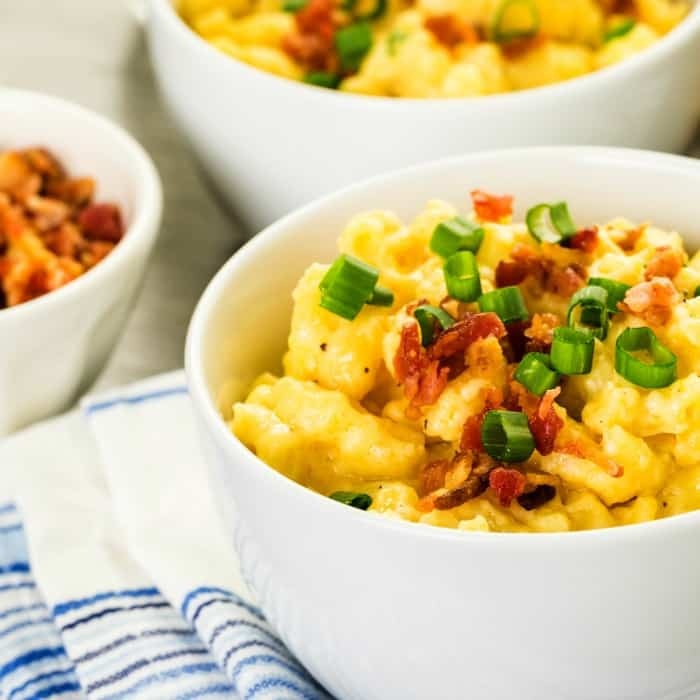 There’s only one thing better than a big bowl of Homemade Macaroni and Cheese: Loaded Bacon Macaroni and Cheese. And, who do you know that doesn’t love mac-n-cheese? Or bacon? Does it surprise you that these two should be married? It shouldn’t. So, eat, my friends, and enjoy. This is a great, quick meal in itself. Just put this on the table with a side salad, and you’ve got a great dish for the family or friends. And, this is one of those “never-fail” recipes. No way can you go wrong–and there are almost never any leftovers. But, if there are leftovers, they will keep in the fridge for a few days, them warm them up in the microwave, and this dish will taste like you just cooked it! I liked to make this when my son and his friends were kids–you know how teen boys are, they can just eat and eat and never get full. So, I would make them a batch of Loaded Bacon Macaroni and Cheese and they’d polish it off, but they’d all be smiling. Literally–Never Fail. Makes a great casserole dish for pot-lucks, too. It’s just super-versatile! Anyway. I hope you enjoy it. Don’t forget to like us on Facebook…we’d love to share more with you! LOL! 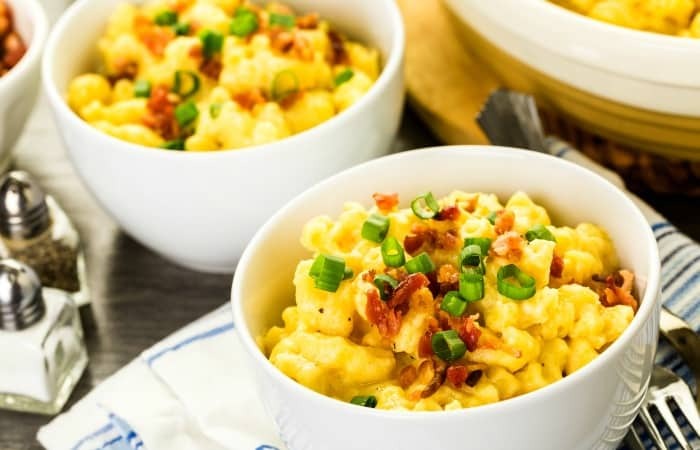 There's only one thing better than a big bowl of Homemade Macaroni and Cheese: Bacon Macaroni and Cheese. While Macaroni is cooking, cook bacon, place on paper towel to drain and cool. DO NOT THROW OUT THE GREASE YET. When the macaroni is cooked, drain and return it to the pot you cooked it in. Take 2 tablespoons of the bacon grease and drizzle over the noodles. Stir until noodles are coated. Add milk, 2 cups Cheddar Cheese, Parmesan Cheese, Sour Cream, and Sun Dried Tomatoes. Stir over low heat until cheddar cheese is melted. Pour into 3 or 4 quart ovenproof casserole dish. Top with remaining grated Cheddar Cheese. 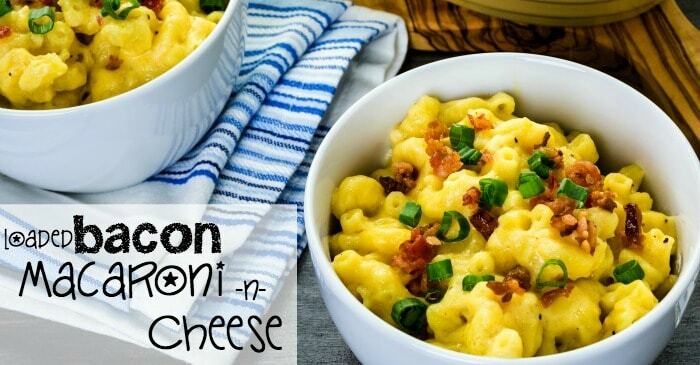 Top with Bacon and Green Onions, serve. 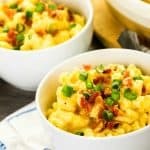 Let me know how your Loaded Bacon Macaroni and Cheese turns-out! I’m excited to hear your feedback!